During the long walk up to Phillim I had not particularly noticed the activity for the New Road, possibly because it was holiday time in Nepal so building work was on hold. 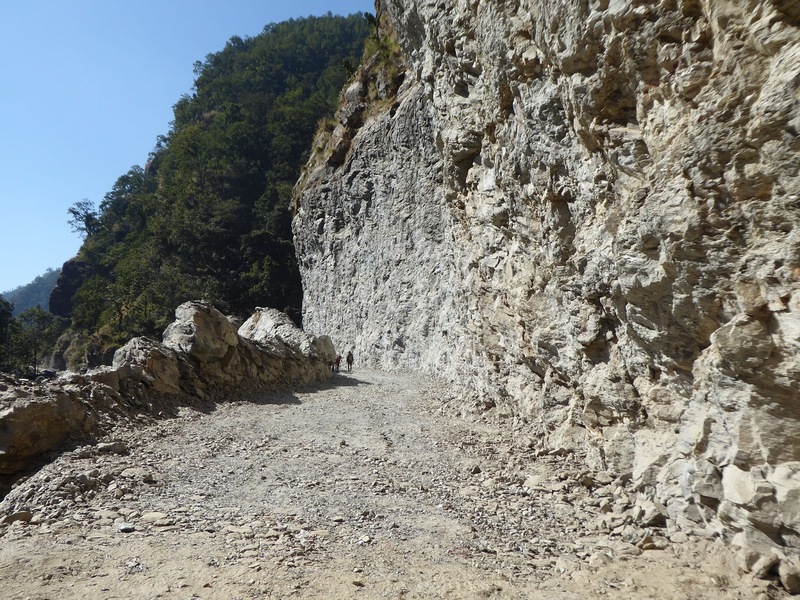 This road is being built up the Manuslu valley and into the Tsum Valley to link Nepal and China. After nearly 4 weeks in the peace of the upper valley, the noise from the building work was a stark reminder of the twenty first century, as we walked down. This road is a huge undertaking! The valley sides are very steep, and at present the path, very narrow in places, rises and falls sharply over cliffs and bluffs. The path crosses numerous side valleys on pedestrian suspension bridges, which will need to be replaced by more substantial bridges capable of carrying road traffic. Men working with drills on the steep hillside. 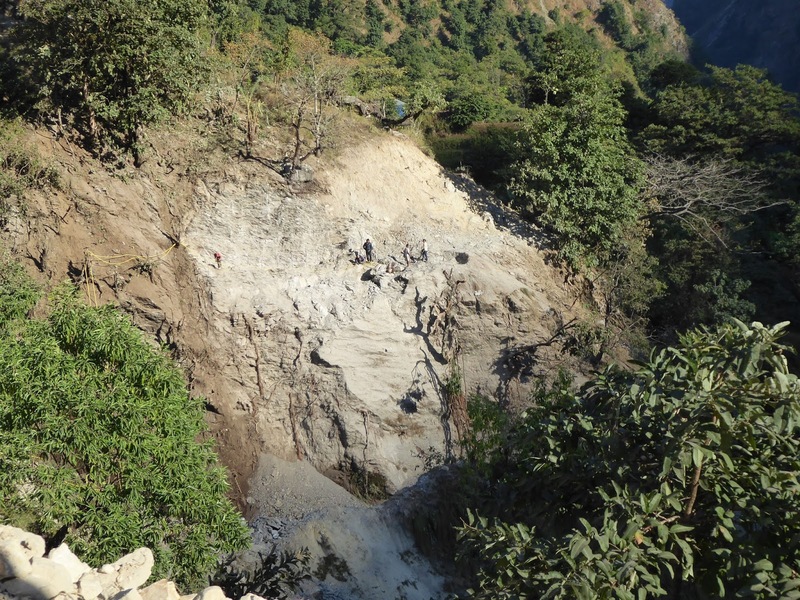 At present, on one stretch of the lower valley, the steep rocky cliffs are being blasted to create enough level land for a road bed. As we walked down we passed small red air compressors, which must have been imported by helicopter, powering heavy duty drilling tools, being used to cut away the rock. Whilst walking below on the riverside beach I was startled to hear and then see a very large boulder rolling down the hillside towards me! I moved fast to make sure I was well clear of its path as it crashed onto the beach. There was a drilling team working on the rock face above. 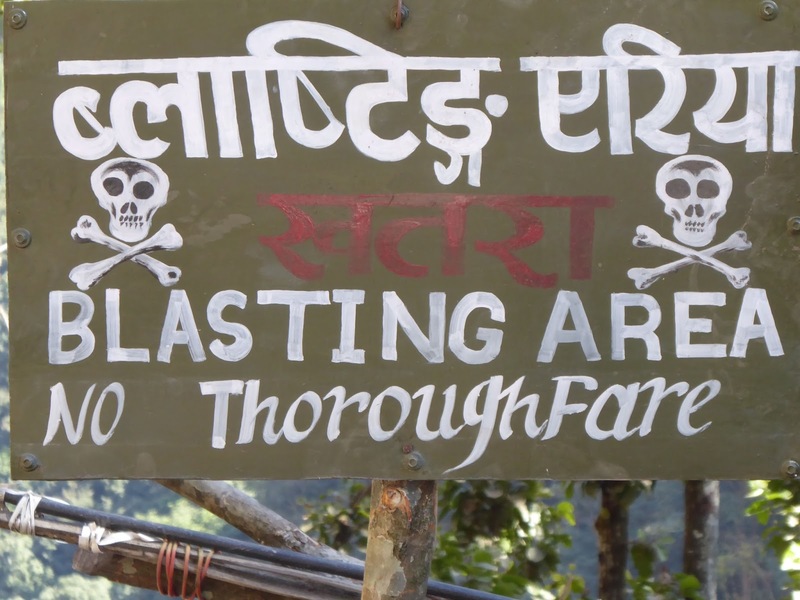 Between Lapubesi and Sotikhola, which is about a one hour walk, the path is shut daily from 6am to 5pm. The alternative route during the path closure is a long detour uphill, of about 3 to 4 hours. Luckily, as we reached Lapubesi, the path was briefly opened for an hour, whilst the workforce ate their morning meal at 11 am. 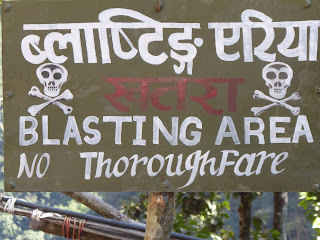 We heard the ‘back to work’ whistle just before we reached Sotikhola. 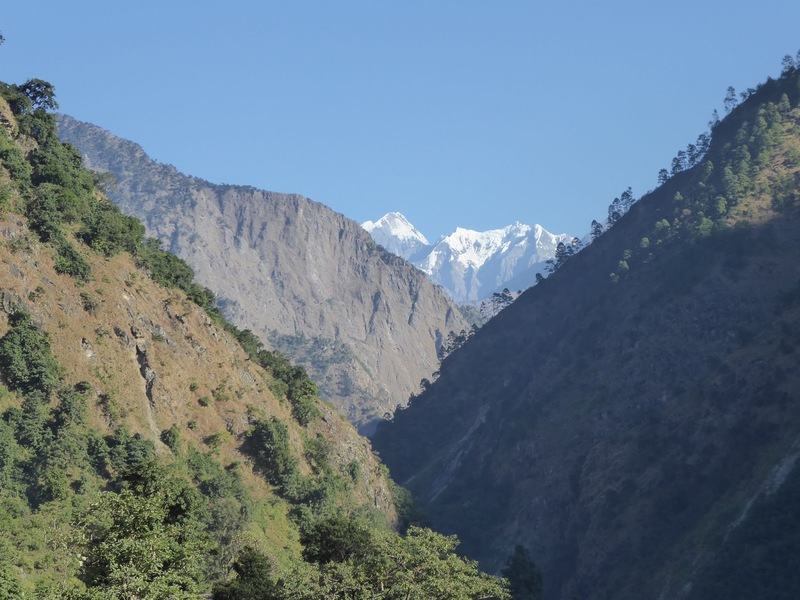 Near Lapubesi we passed a large number of porters carrying heavy looking cardboard boxes, escorted by army personnel equipped with guns. We deduced that these cardboard boxes being transported up the valley contained gunpowder for the blasting operations. The new road bed cut from the rock. It is with some sadness that I witnessed the building of this road. The Manuslu trail is, at present a spectacular walk, unblemished by the 21st Century. In Phillim there are no cars, lorries or motorbikes and the children can wander and play safely around the village. Many children have never seen a car, bus or motorbike. Modern noise pollution is only present with the excitement of the occasional landing of a helicopter. 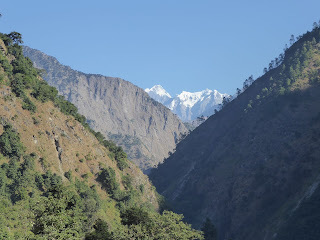 The ever present sound of the river and the occasional sound of domestic animals gives the valley a timeless quality. In a few years time the completion of the road will mean the loss of this tranquillity. 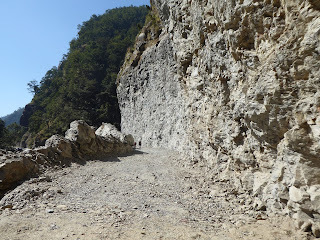 I share Ann's ambivalence about the road building as I trekked Manaslu and visited a school Ann aids. One hopes there is an alternate route to walk after necessary roads built.